This title offers a comprehensive history of modern counterinsurgency, covering the key examples of this widespread and enduring form of conflict. It identifies the political, military, social, and economic measures employed in attempting to overcome insurgency, examining the work of the individuals and organizations involved, demonstrating how success and failure dictated change from established policy, and carefully analyzing the results. 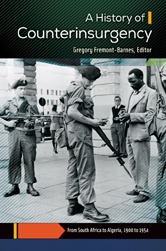 Readers will gain valuable insight from the detailed assessments of the history of counterinsurgency that demonstrate which strategies have succeeded and which have failed-and why.